Sarah Johnson is once again taking her plight to the Idaho Supreme Court, appealing a 5th District Court decision earlier this year that denied her a new trial for the murders of her parents in 2003. "Although I respect Miss Johnson's right to appeal, I am confident that Judge Bevan's ruling will be upheld," Blaine County Prosecuting Attorney Jim Thomas said Monday. "It was a very thorough and reasoned opinion and I would be surprised if the high court disturbs any of his findings." Thomas was referring to a decision by Judge G. Richard Bevan that was issued in April and denied all of Johnson's claims that she was unjustly tried in 2005. Bevan's decision followed several years of litigation in a post-conviction-relief case filed by Johnson in 2006 and a four-day evidentiary hearing in December 2010 in Twin Falls. Hailey attorney Christopher Simms, assigned by the court to represent Johnson, had alleged that Johnson was unjustly tried because of ineffective legal counsel during her murder trial. Simms further claimed that new fingerprint evidence that surfaced after the trial raised questions as to Johnson's guilt. In his ruling, Bevan determined that the new fingerprint evidence was insufficient to cause an acquittal and that any errors committed during Johnson's trial were not significant enough to change a guilty verdict because the evidence against her was "indeed overwhelming." In filing the appeal, Simms requested that the Idaho Supreme Court determine "whether the district court erred." The appeal is one of the last documents to be filed by Simms, who has now been allowed to withdraw from the case. Prior to withdrawal, Simms filed a motion requesting that Johnson's post-conviction-relief issues be handled by the State Appellate Public Defender's Office, which typically handles appeals for indigent inmates. That motion has now been granted. The state has been represented in post-conviction-relief proceedings by the Idaho Attorney General's Office, which will continue on the case through the appeal process. "We'll need to see what issues she raises in her brief and then we'll file our brief," Attorney General spokesman Bob Cooper said Tuesday. Johnson is currently serving two life prison sentences without the possibility of parole for the first-degree murders of her parents, Alan and Diane Johnson, at the couple's home in Bellevue on Sept. 2, 2003. Johnson, now 24, was 16 at the time. Johnson's case has been to the high court before. 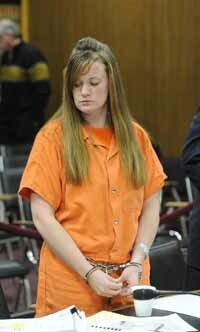 Her murder convictions were previously appealed to the Idaho Supreme Court, which upheld the convictions in 2008. Later that year, the U.S. Supreme Court declined to consider the case. Johnson's latest appeal is a civil case addressing the question of whether she had a fair trial rather than whether her conviction was justified.